Fabiano Caruana is a Grand Master with U.S. and Italian citizenship. In his youth, he was known for a very aggressive playing style where he was willing to sacrifice a lot of pieces. Today, his playing style is more varied. Caruana is a “Benefactor” Life Member of the United States Chess Federation (USCF). After moving from the United States to Europe, Caruana won the Italian National Championship in 2007, 2008, 2010 and 2011. (He didn’t participate in 2009 or after 2011.) He has never played in a U.S. Chess Championship. Since Caruana has dual citizenship, he has the option of FIDE affiliation with either Italy or U.S. He played for Italy from 2005 and onward, but in May 2015 he announced that he would change federation and start playing for the United States. Caruana was already playing chess when he was five years old. When he was six, Bruce Pandolfini started training him. Between the age of 8 and 12, Caruana was trained by Grand Master Miron Sher. During this period of Caruanas life, focus was on chess tournaments within the United States, and Caruana rarely traveled abroad to participate in tournaments. 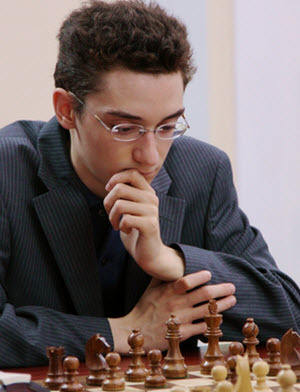 Caruana won the 2002 and 2003 Pan-American Junior Championships. In 2004, when Caruana was 12 years old, the family moved to Madrid where Caruana was trained by International Master Boris Zlotkin. Caruana became an International Master in April 2006. That same year, he placed second in his first Italian Championship, and won tournaments in both Madrid and Alcala de Henarez. In 2007, the family moved to Budapest, where Caruana is trained by Alexander Chernin. Caruana won three consecutive (March, April and May) Budapest First Saturday Chess Tournaments. On July 15, 2007, Caruana became Grand Master. He was 14 years, 11 months and 15 days old, and the youngest Grand Master of both the United States and Italy. (In all, Italy only had four Grand Masters prior to Caruana.) In December that year, Caruana also became the youngest ever Italian Chess Champion, by winning the Italian Championship with a score of +8 (9½/11). After winning Coruc C 2008, Caruana was invited to play Corus B 2009. Throughout the tournament, Caruana stayed in the top-3 spots. Caruana eventually won the tournament with a score of +4 (8½/13) and performance of 2751. He this became the first player ever to win both Corus C and Corus B in consecutive years, placing clear first in both. Caruana finished second place in the 74th Tata Steel Chess Tournament (formerly known as Corus Chess) in 2012, together with Magnus Carlsen and Teimour Radjabov. Levon Aronian won the tournament. Caruana won the 2012 Reykjavik Open with 7½/9. At the Sixth FIDE Grand Prix in 2013, Caruana and Boris Gelfand shared first place with 5/9. Caruana won the 7th edition of Kings Tournament in Bucharest, Romania in 2013.